Rocky Mountain elk bull; watching over his herd from the top of a hill on the west side of Rocky Mountain National Park. Photo by Andrew E. Russell/Flickr (Use Permitted with Attribution). Called 'wapiti' by the Shawnee Indians, elk are members of the deer family and associate closely with the deer and moose of Utah. Elk once inhabited most of the USA, but are now found only west of the Rocky Mountains (elk are plentiful in the mountain ranges of Utah). Native Americans prized the elk for it's meat and hide, but with the influx of settlers, elk were slaughtered not just for food and leather, but also as sport. The elk's canine teeth were used as charms and many were killed for that reason alone. By the 1800's the elk was completely wiped out in the eastern part of the country, and it's numbers drastically reduced in the west. 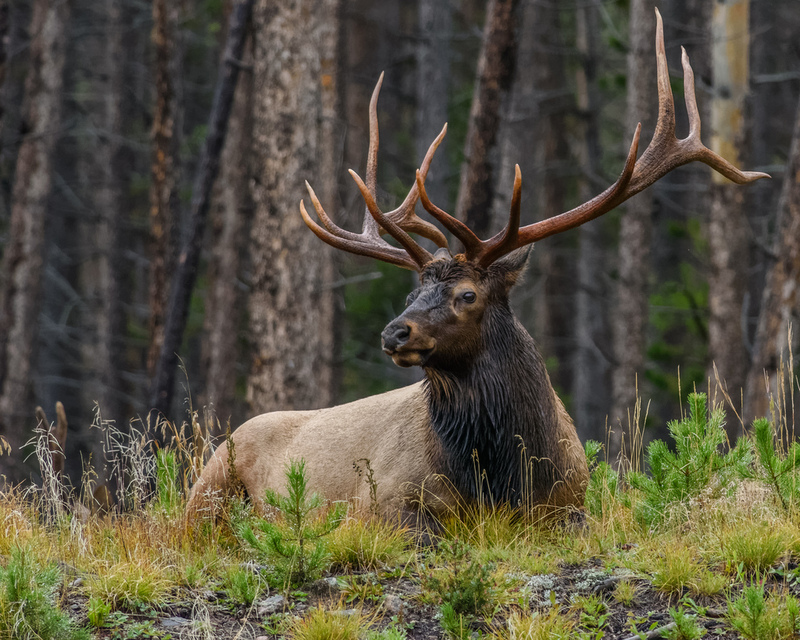 In the early 1900's naturalists, hunters and many others began lobbying for regulated hunting seasons, national wildlife refuges, and national parks and forests, which has assured the survival of the elk. Elk spend most of their lives in family groups - herds will flourish anywhere there is sufficient water, food & shelter. Grasses are their primary source of food, but berries, mushrooms, wildflowers and cattails help the elk build fat for winter. Shrubs and twigs and needles of fir and juniper trees are also eaten in harsh winters. Bull elk begin gathering harems in late summer in preparation for the breeding season in the fall. Dramatic vocalizations are heard from the bulls during the rutting season. 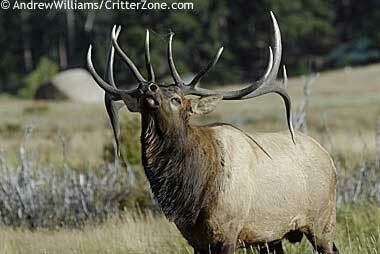 A piercing bugle call, barking, mewing, and squealing are some of the sounds elk use to communicate. A bull elk may grow to 5 feet at the shoulder and weigh from 600 - 1200 pounds. Antlers can spread 6 feet and weigh 50 pounds. The female (cow) is smaller and does not have antlers. Rocky Mountain elk bull; photo © Andrew Williams / Critterzone: Animal Pictures, Nature Stock Photography (all rights reserved; used by permission).